The Gemini South laser guide star "constellation" (upper left) is captured in this image by Maxime Boccas, the lead of Gemini’s Optical Systems Group, and Science Fellow Benoit Neichel. 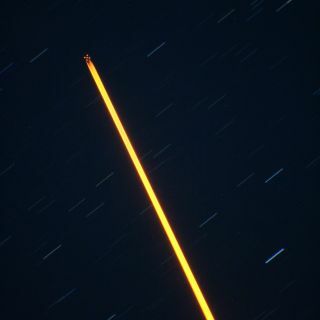 The image shows the 50-watt laser beam as it shines upward toward the atmospheric sodium layer about 90 kilometers above the earth’s surface to create a pattern of five artificial guide stars used to sample atmospheric turbulence for the Gemini Observatory’s GeMS adaptive optics system. To help take extra sharp images of space, a telescope in South America is firing a mega-laser – one made up of five beams – into the night sky. The sodium laser "constellation" – as scientists call it – is part of a telescope at the Gemini South Observatory in Chile and is the cornerstone for a next-generation adaptive optics system. Photos of the laser in action reveal it as a thick, bright yellow beam of light cutting through the night sky. Adaptive optics is a technique used by telescopes to filter out the hazy interference of Earth's atmosphere during astronomical observations. Computers analyze the light from a natural or artificial guide star, and then use that light as a baseline to determine the blurring effects of the atmosphere. Hundreds of actuators can then be used to warp the surface of the telescope's mirrors thousands of times per second to cancel out any blurry effects. The constellation of five lasers used at the Gemini South telescope serves as the artificial guide star for its next-generation adaptive optics system, called the Gemini Multi-Conjugate Adaptive Optics (MCAO) System – or GeMS. It consists of a single 50-watt laser that is then split into five individual beams that create a five-point "star" grouping when they're fired 56 miles (90 kilometers) into the sky. Computers use the lasers to build a real-time, three-dimensional view of the atmosphere and use that data to change the shape of the telescope's mirror to cancel out blurring effects about 1,000 times per second. The Gemini South telescope on the night of January 21-22, 2011 during the first propagation of the GeMS laser guide star system on the sky. A bright gibbous moon illuminates the landscape for this 20-second fisheye lens view. Astronomers switched the laser system on for the first time on Jan. 22 while a photographer documented the event with a digital camera equipped with a 500 millimeter lens. “The Gemini team has been working very hard for a very long time to get to this point and when I saw those 5 stars shining on the sky through my viewer it gave me goose bumps,” said Maxime Boccas, head of the Gemini Observatory’s Optical Systems Group, who took some of the photos. The GeMS system's laser guide stars are not actually visible to the unaided eye. To see them, observers would need a telescope or powerful binoculars, Gemini Observatory officials said. At ground level, the laser is visible to the unaided eye due to scattering effects, they added. Those scattering effects allowed photographers to snap dazzling photos of the laser constellation at work. An interior view of the Gemini South during propagation of the laser guide star system during on-sky testing of the laser system. “This amazing picture illustrates the culmination of a laser development program that started about 10 years ago,” said Gemini Observatory’s senior laser engineer Céline d’Orgeville. The new laser system is expected to undergo a series of commissioning tests before it begins science observations in 2012. The system is expected to generate ultra-clear views of distant galaxies, newborn stars and other cosmic objects.